You choose silver as savings target. With each purchase, you will be allocated parts of large Gold Bullions. due to its bactericidal effect, silver is most important for medical use. The industry benefits from this effect in refrigerators and washing machines. Already the ancient Egyptians knew this effect and kept drinking water in silver-covered vessels. Silver has the highest electrical and thermal conductivity of all metals and is installed in every car, mobile phone and every light switch. Silver does not oxidize and is irreplaceable in industry. 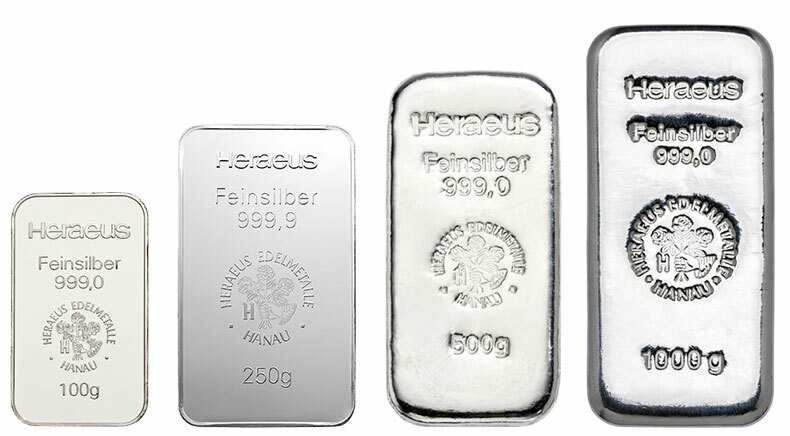 Silver benefits from the fact that only a small part of it is seen as investment metal, and that most of the annual new production is needed for industrial purposes. "The urgently needed and outgoing silver is not properly assessed and represents a unique opportunity." Silver can not be mined indefinitely. The total amount that can still be mined is estimated to be about 510 000 tonnes and is only enough for about 20 years with the same production rate. The worldwide water scarcity leads to the development of new ways of water production using silver. The growing world population requires electrical equipment and the demand for medical applications is increasing. Other applications are solar plants. Solar energy is an emerging area that requires a high future silver demand.